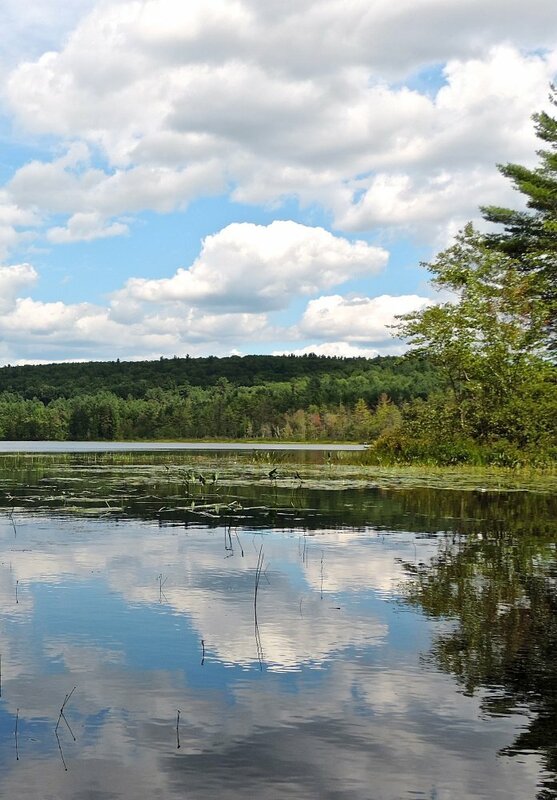 Taking a paddle on little Heald Pond in Lovell will be well worth the trip to western Maine. If you are looking for a spectacular canoe outing on a macro scale – with Alpine peaks, big cliffs and deep water – then Kezar Lake might be the choice. Arrowhead blooms on the surface at Heald Pond. But also in the neighborhood is a spectacular trip on a micro scale at nearby Heald Pond. You get the idea. 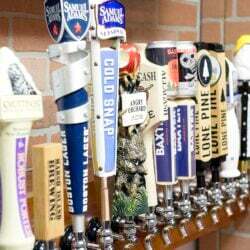 It’s a good thing in a small package in the western Maine town of Lovell, a little over an hour west of Lewiston and less than 90 minutes north of Portland. The western side of Heald was acquired by the Greater Lovell Land Trust in 1996 and protects one mile of mixed forest shoreline. We enjoyed a leisurely two-hour outing, most of the time consulting the field guide, soaking up the warm afternoon sunshine and waiting for a moose to appear. We did eventually mange to circuit the pond. A classic old farm up on the Slab City Road peers down over golden fields leading down to the pond. There are a few cottages on the southeastern and northeastern corners of the pond. 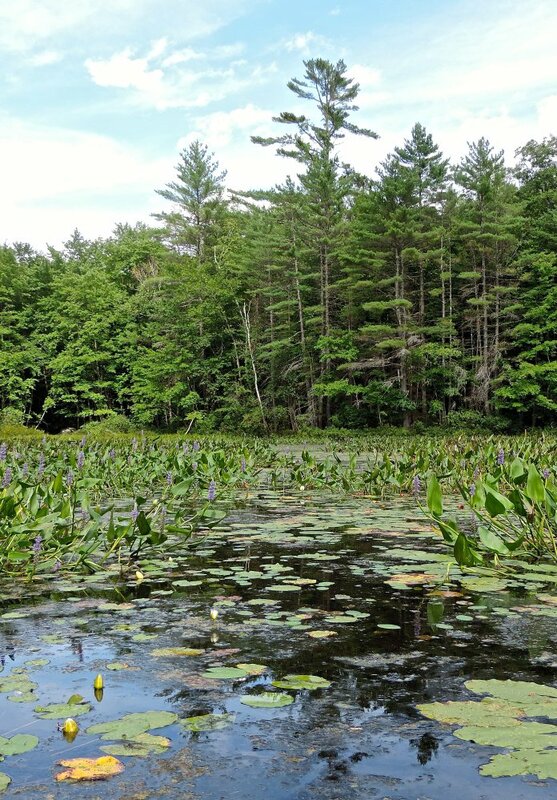 In between sits a scenic marsh with a small channel that can be followed 50 yards to the east through pickerelweed and buttonbush to a beaver dam, which stopped any further exploration. You are swallowed up in flowers and showy bog plants. Get the camera out – and try not to tip over your canoe getting that dazzling National Wildlife magazine cover shot. 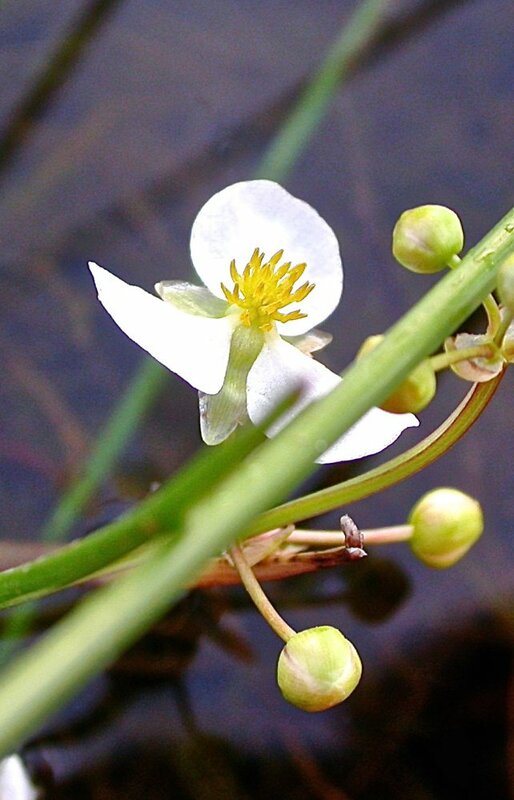 Arrowhead flowers with their yellow stamen surrounded by three delicate white petals caught our attention. Also known as duck potatoes, their tubular roots were harvested by native peoples as a source of food. On their journey west, Lewis and Clark bartered for these tubers with natives as often as they were available. The pond is surrounded by low forested hills, many showing splashes of emerging yellow foliage mixing with summer green. We heard a pileated woodpecker working away on a hillside tree. The shape of the surrounding hills amplified the sound into the jackhammer category. The soothing sound of cooing mourning doves also mixed with the high-pitched calls of nuthatches. Maybe we were there just at the late summer apex of blooming, or maybe Heald Pond has more turtlehead flowers and brilliant cardinal flowers than any pond we have explored in Maine, but what a display along the middle portion of the western shoreline. The bold red of the cardinal flower was made even more so by the sylvan shadows they were pulsating out of. Unlike most flowers, the cardinal flower depends on hummingbirds, not insects, to do its pollinating. If you still have energy left to burn, consider a short hike on the trail system of the Greater Lovell Land Trust. A convenient option is to hike right from the boat launch area through the woods west of Heald up toward Bradley Pond. A short spur trail leads down to Otter Rocks on Heald Pond affording great views toward the marsh and south to the farmhouse. Another good option is to drive back out to Route 5 and head north to a trailhead just south of Lovell Cemetery for a short hike up 955-foot Amos Mountain. Near the top sits a large glacial erratic boulder called El Pulpito that features a large rectangular chunk broken out of it sitting a few feet away. From here there are limited views down through the trees to the islands in Kezar Lake’s Upper Bay. Have a reason to celebrate – birthday, anniversary, important milestone? – how about an elegant meal at the famous Center Lovell Inn while gazing west from their screened-in porch over to the mountain kingdom of Evans Notch. Consult the Delorme Maine Atlas and Gazetteer (map No. 10) for help in getting to the boat launch site. From Route 5 in Lovell turn east onto the Slab City Road and follow for a half-mile. The boat launch is on the left just beyond the short bridge over Mill Brook. A sawmill was built here in 1840, one of many in the area. The outside cuts of the logs, known as slabs, were stacked along the road, giving the road its name.